Please join us and share in worship at St John's Lutheran church! Welcome to St John’s Lutheran Church on the web. We invite you to share God’s grace and serve though love with us! 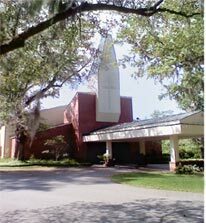 St. John’s Lutheran Church is a vibrant community of people gathered in the name of Jesus Christ in Beaufort SC. of God to serve our neighbors. We hope you will sense the joy we find in this community. All are welcome to join us at St. John’s Lutheran, in worship or any of our activities. We ask for your prayers as we seek to grow in God’s mission! Nursery provided during Sunday School and second service. Wednesday night services are held weekly during Advent and Lent. Volunteers needed for the Welcome Table on Sunday mornings, and Wednesday Night Together meals. Please sign up in the narthex, or contact Sam Cowan by email - scowan410@gmail.com if you are willing to assist in this ministry. See Young Adult Info Page for details. See St. John's Lutheran Men's page for details. See St John's Lutheran Women's Page for details. See Family Promise page for details. Please check the calendar page for more events and meetings. Items needed for CODA (Citizens Opposed to Domestic Abuse. Basket marked "CODA" in narthex. See CODA Page for details. Helena House Bingo Prizes needed. See Helena House Page for details.